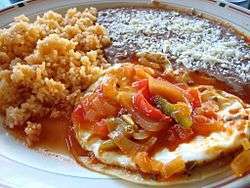 Huevos divorciados, or "divorced eggs," is a Mexican breakfast featuring two fried eggs, sometimes separated by a line of a refried beans or chilaquiles. Typically, one egg is covered in salsa roja, while the other is covered in salsa verde, giving them distinct and complementary flavors. ↑ Dona Savitsky & Thomas Schnetz (2006). 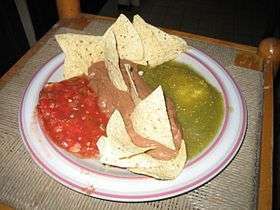 Dona Tomas: Discovering Authentic Mexican Cooking. Random House Digital, Inc. pp. 42–44. ISBN 9781580086042. Retrieved 26 November 2012.